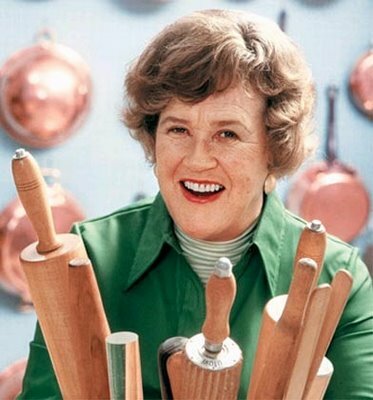 Julia Child has re-entered my life through the popularity of Julie & Julia (the book and the movie.) After reading the book last week, I was determined to cook at least one of Julia Child's recipes. The Beef Bourguignon has been described as the 60's housewife favorite dinner dish. Which made me think, "shoot, if housewives across America could make it, so can I." I found the recipe online which was clearly marked "Degree of Difficulty: Difficult." I promptly ignored that, and bought all the ingredients. I quickly scanned the recipe and saw "place in oven for 3 hours" which I interpreted as "place in the oven and you will have 3 hours of free time." Oh contraire!!! This recipe took a solid 5 hours of physical labor. Don't even think about leaving the kitchen, or meeting your boyfriend to watch the football game you promised you'd watch with him. You cook every ingredient separately. You saute the onions on their own for 50 minutes. You will sweat your brains out, and if you are anything like me, you will unleash a flaming slew of cuss words on the mushrooms that keep falling on the floor. It was tasty. It's true. And even better the next day. I served with mashed potatoes. Check out this video of Julie Powell cooking Beef Bourgiugnon (she makes it look easy). 1. Remove bacon rind and cut into lardons (sticks 1/4-inch thick and 1 1/2 inches long). Simmer rind and lardons for 10 minutes in 1 1/2 quarts water. Drain and dry. Preheat oven to 450 degrees. Sauté lardons in 1 tablespoon of the olive oil in a flameproof casserole over moderate heat for 2 to 3 minutes to brown lightly. Remove to a side dish with a slotted spoon. 2. Dry beef in paper towels; it will not brown if it is damp. Heat fat in casserole until almost smoking. Add beef, a few pieces at a time, and sauté until nicely browned on all sides. Add it to the lardons. Then sprinkle on the flour and toss again to coat the beef lightly. Set casserole uncovered in middle position of preheated oven for 4 minutes. Toss the meat again and return to oven for 4 minutes (this browns the flour and coves the meat with a light crust). Remove casserole and turn oven down to 325 degrees. 4. Stir in wine and 2 to 3 cups stock, just enough so that the meat is barely covered. 5. Add the tomato paste, garlic, herbs and bacon rind. Bring to a simmer on top of the stove. 6. Cover casserole and set in lower third of oven. Regulate heat so that liquid simmers very slowly for 3 to 4 hours. The meat is done when a fork pierces it easily. 7. While the beef is cooking, prepare the onions and mushrooms. Heat 1 1/2 tablespoons butter with one and one-half tablespoons of the oil until bubbling in a skillet. Add onions and sauté over moderate heat for about 10 minutes, rolling them so they will brown as evenly as possible. Be careful not to break their skins. You cannot expect them to brown uniformly. Add 1/2 cup of the stock, salt and pepper to taste and the herb bouquet. Cover and simmer slowly for 40 to 50 minutes until the onions are perfectly tender but hold their shape, and the liquid has evaporated. Remove herb bouquet and set onions aside. 8. Wipe out skillet and heat remaining oil and butter over high heat. As soon as you see butter has begun to subside, indicating it is hot enough, add mushrooms. Toss and shake pan for 4 to 5 minutes. As soon as they have begun to brown lightly, remove from heat. 9. When the meat is tender, pour the contents of the casserole into a sieve set over a saucepan. Wash out the casserole and return the beef and lardons to it. Distribute the cooked onions and mushrooms on top. 10. Skim fat off sauce in saucepan. Simmer sauce for a minute or 2, skimming off additional fat as it rises. You should have about 2 1/2 cups of sauce thick enough to coat a spoon lightly. If too thin, boil it down rapidly. If too thick, mix in a few tablespoons stock. Taste carefully for seasoning. 11. Pour sauce over meat and vegetables. Cover and simmer 2 to 3 minutes, basting the meat and vegetables with the sauce several times. Serve in casserole, or arrange stew on a platter surrounded with potatoes, noodles or rice, and decorated with parsley.